What is Noble 8 Revolution? An MLM Giving To Charities! I came across Noble 8 Revolution when one of my readers mentioned the company as a money-making opportunity. I had a look at the program and the first thing that caught my eye was the statement below. They then name the “8 Pillars of noble giving” or the types of charities they will be supporting. Promoting Noble 8 as making money for charities may look good but this is often used to entice people into a program by playing on their emotions. This could even be considered as a red flag! So is this a legitimate opportunity or a recruiting scam? Find out in my review. Cons: Relies on recruiting new members. This will inevitably fail after a certain time. Uses giving money to charities to encourage new memberships. My opinion: A multi-level marketing scheme that uses giving to charities as a means to encourage new members. Recruitment will inevitably fail after a certain time leaving many out of pocket. It’s nice to see the founders of this company are ready to put their names to Noble 8. Although this doesn’t guarantee that this is a legitimate program or there are no dangers involved, it does make a pleasant change. On the other hand, there is no address for the location of the company. The founders of the company are Mark Campese, CMO, Jim Anderson, President, and Blaine Williams, CEO. All 3 have been successful in network marketing. Prior to starting Noble 8 Revolution Jim Anderson was President of Noble 7 Crowdfunding a very shortlived recruiting program. Mark Campese and Blaine William were involved in the Wasszup Global program, where they were both “terminated”. Below is an extract of what Wasszup said about them on their Facebook page. Even Though Both Of Them Had Promised To Stop Their Practice Of Stacking And Duping Partners By Collecting Funds For Their Unauthorized Marketing Systems , They Continued To Do So. They Both Also Were Planning 2 Months Ago To Start Their Own Co And Was Canvassing WCF Partners . Nothing very encouraging about the founders, let’s see what Noble 8 Revolution is all about! You may also like: Motor Club of America Review. Is MCA a scam or legit? What is Noble 8 Revolution? According to Noble 8 Revolution, this is a platform that will help you to achieve your financial dreams and also give 10% of every dollar coming into the system to charity. They are an MLM opportunity in the personal growth and development niche. To join the program you purchase a course for $25. Then if you like what you see you can market the course to others. Or if you think you can make money with the scheme you might try to recruit new members regardless of the courses. You purchase the entry-level Life Mastery Academy Course, 8 Steps to a Dynamic Life, for $25. Then you bring in 3 people who make the same $25 purchase. When you have your 3 “customers” your status changes from customer to Independent Business Leader, (IBL). You will then earn your first $25 commission effectively making your course free. To earn any money from the system you must refer at least 3 people who purchase the Life Mastery Academy Course. In order to maximize your Noble 8 Revolution compensation plan, you need 8 qualified sales. As each new customer or member shares the Noble 8 story and vision they will attract new members and grow the platform. The question with schemes like this is are you paying to become a member and then recruit others or are you paying for a product? In my opinion, with Noble 8, you are paying to join and then to recruit others. You are paying for the money-making opportunity. On the Noble 8 Revolution website, there is virtually no information about what is included in the “personal development E-courses, weekend leadership development retreats, ultra-luxurious resort destination and cruise educational and empowerment’s vacations”. Would you be able to sell these courses? I think the only reason someone would join Noble 8 is for the opportunity to make some money. And from what I have seen this is how people promote the program. You will earn commissions when you get others to purchase positions. The matrix size in Noble 8 Revolution is 3 x 5. This means after your purchase you are placed at the top of a matrix with 3 positions directly under you. These 3 positions are the first level of the matrix. On the next level, there are 3 positions under each of the 3 first level positions making a total of 9 positions. This continues on all 5 levels of the matrix. Each level has 3 times as many positions as the previous level. The other campuses – Apprentice Campus, Mentor Campus and the Master Mentor Campus work in a similar fashion with increased fees and commissions. You can see the full compensation plan here. As you can see from the above table to keep earning your commissions you will have to recruit more and more people into the system. Noble 8 Revolution claims to be helping charities. It’s probably the first thing that will catch your eye when you land on their website. Are they doing this because they want to help the charities? Or do they mention giving money to charities to play on your emotions and to make them look legitimate? I think the latter. Is getting money from recruiting members into a program and then encouraging them to recruit others into the system a legitimate way a help charities? Unfortunately, I don’t think so! Many of those who join will end up losing their money. People at the bottom of the pyramid will lose money or at best make pennies. The people who make money will be the founders and anyone who got in early. The inevitable end of a program like Noble 8, is that the new recruits will eventually dry up. If you’re thinking of joining Noble 8 Revolution this article from the FTC is worth reading first. Just the first page will give you an idea of what you’re getting into, with an overall view of the MLM industry. You’ve now got the facts and you can make your decision but I don’t recommend joining Noble 8 Revolution. There are other ways to make money online that 100% legitimate. Whatever you choose you should be aware that making money online isn’t easy, it will take time and hard work. If you have joined Noble 8 Revolution or any other MLM let us know about your experience in the comments area below. 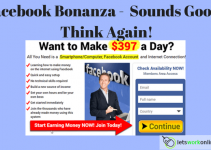 What Is Facebook Bonanza? Too Good To Be True or Legit?